All transactions are safe and secure with a reliable history in online purchasing behind each of our associates. Buy the Monty Python Tis but a Scratch t-shirt to own Monty Python clothing and merchandise. One of the most memorable scenes in the Holy Grail movie is when King Arthur fights the Black Knight. 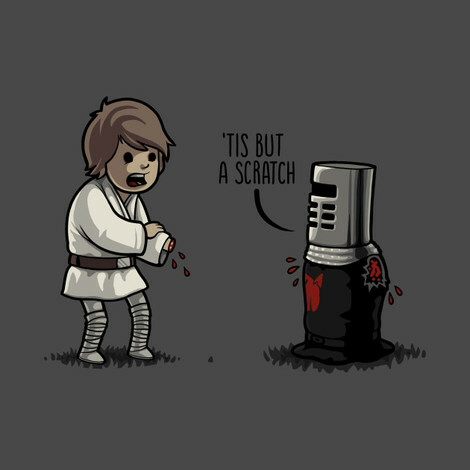 The quote, "Tis but a scratch," refers to the knight's refusal to give up, even after he has been dismembered. This design features the Black Knight comforting Luke Skywalker after the Jedi loses his hand during his fight with Vader. The morbid comedy contained in the scene is similar to that found in many of the Monty Python and the Flying Circus comedy skits. These Black Knight Monty Python t-shirts are enjoyable joke tees that celebrate the Flying Circus style of British humor. In addition to the Monty Python Tis but a Scratch tee above, browse the Monty Python Clothing Gallery for more apparel like men's and women's clothes, kids shirts or hoodies.